The Woman's Club of Brielle is a member of the New Jersey State Federation of Women’s Clubs which was founded in 1894 as an affiliate branch of the National General Federation of Women’s Clubs founded in 1890. 63 clubs came together to form the General Federation of Women’s Clubs in New York City under the leadership of GFWC founder Jane Cunningham Croly. Today, with over 80,000 clubwomen and 3,000 clubs, we continue to stand together and celebrate Unity in Diversity. The General Federation of Women’s Clubs (GFWC), the largest women’s volunteer organization in the world, is a unifying force bringing together local women’s clubs with members dedicated to strengthening their communities and enhancing the lives of others through volunteer service. GFWC members are community leaders who work locally to create global change by supporting the arts, preserving natural resources, advancing education, promoting healthy lifestyles, encouraging civic involvement, and working toward world peace and understanding. Today, the New Jersey Federation of Women’s Clubs includes more than 220 local clubs and more than 7,500 individual members. In addition, the New Jersey State Federation of Women’s Clubs is a proud partner with Douglass Residential College at Rutgers University. Douglass students enjoy the many benefits of partnerships including NJSFWC sponsored scholarship programs. Since the establishment of The Woman's Club of Brielle in 1967, the club has organized fundraising events to support many charities which include our local library, the fire department as well as other community organizations such as food banks and shelters for domestic abuse victims. The Club also awards yearly scholarships to local students and a scholarship to a woman returning to college. Members of the Club have also worked on more specific community improvement initiatives, such as campaigns to have traffic lights installed at dangerous curves and intersections. The Club’s operations and activities have been based out of the Curtis House Community Center since 1980 and the Club has conducted an ongoing Community Improvement Project to decorate and furnish the house and its facilities. Located at 644 Union Lane at Green Acres Park in Brielle, the Curtis House property was used as a gladiola farm before being purchased by the Borough in 1968. The Community Center’s facilities, which the Club shares with other local organizations, Union Landing Historical Society and the Bayberry Garden Club, include large meeting rooms, activity spaces and seating for more than 150 people. 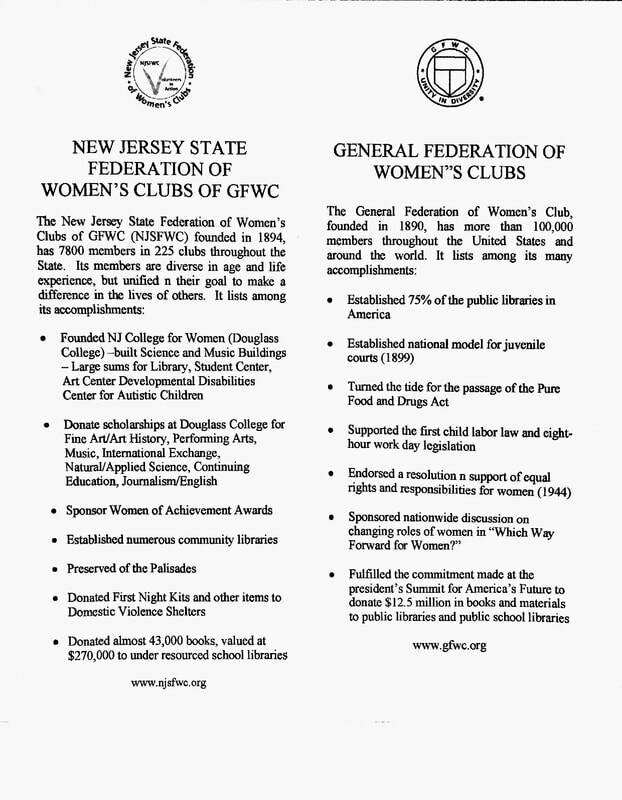 To review websites from the General Federation of Women's Clubs (GFWC) or the New Jersey State Federated Women's Club (NJSFWC), please visit their links below. The Woman's Club of Brielle, Inc.